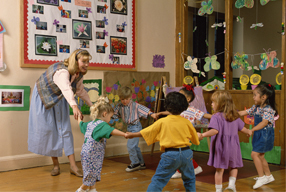 Learning should be fun, interesting and applicable to your child care situation. When you invest in your continuing education, you deserve to be getting current expert information in an engaging way. Our classes are designed to live up to these high ideals. 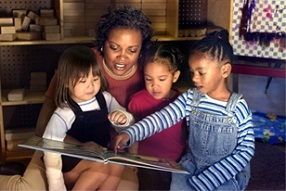 The work you do with young children is wiring their brains. These classes aim to give you the tools to do your best in helping these children achieve their best. How will I benefit from these online classes? You take these classes from the comfort of your own home. These classes each qualify for 2 hours of continuing education credit. 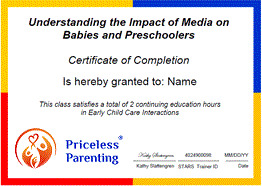 If you are in the Seattle area, you can also schedule a presentation at your school or child care center. What steps do I need to follow to get my continuing education credit? Register and pay for the course. Complete all lessons and answer questions. Complete a training evaluation form. After completing the course, you will receive a Certificate of Completion that you can submit to your licensor. If you work within the state of Washington and have a STARS ID, you will be given credit for the class in the Washington MERIT database. This credit applies to the annual 10 hours of continuing education requirement. Where can I learn more about the STARS program? 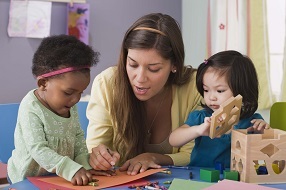 For additional information about the STARS program, call Washington STARS at 800-727-3107 or 253-854-2565 or visit The Washington Department of Early Learning's MERIT site. Taking an online class is convenient. You can take the lessons whenever you have the time. If you are busy for a week, you can skip that week and pick up where you left off. The classes are self-paced so you can repeat a section if you want to. "This program is simple to use and suggests easy applications for supporting pro-social behavior in children that is valuable both at home and in the classroom. It includes practical, easy to use techniques that honor family values and child autonomy. I especially liked the additional links to quick references like the 'Eighteen Ways to Avoid Power Stuggles'." "I just want to tell you that I am enjoying this class! I think it really helps the way I perceive the job we do as teachers. Many times over the years, you ask yourself "did I handle this the best way I could?" We are teachers, but we NEVER stop learning. Things are so very different now from when I was young. I think that looking back, I can really see what was effective parenting, and what was not. Hopefully, we can take the best things to pass on to today's children!"